For the Learning Channel's Great Books series, see The Learning Channel's Great Books. The original editors had three criteria for including a book in the series: the book must be relevant to contemporary matters, and not only important in its historical context; it must be rewarding to re-read; and it must be a part of "the great conversation about the great ideas", relevant to at least 25 of the 102 great ideas identified by the editors. The books were not chosen on the basis of ethnic and cultural inclusiveness, historical influence, or the editors' agreement with the views expressed by the authors. A second edition was published in 1990 in 60 volumes. Some translations were updated, some works were removed, and there were significant additions from the 20th century. The project for the Great Books of the Western World began at the University of Chicago, where the president, Robert Hutchins, collaborated with Mortimer Adler to develop a course—generally aimed at businesspeople—for the purpose of filling the gaps in their liberal education; to render the reader as an intellectually rounded man or woman familiar with the Great Books of the Western canon, and knowledgeable of the great ideas developed in the course of three millennia. An original student of the project was William Benton (later a U.S. senator, and then chief executive officer of the Encyclopædia Britannica publishing company) who proposed selecting the greatest books of the Western canon, and that Hutchins and Adler produce unabridged editions for publication, by Encyclopædia Britannica. Hutchins was at first wary of the idea, fearing that commodifying the books would devalue them as cultural artefacts; nevertheless, he agreed to the business deal and was paid $60,000 for his work on the project. After deciding what subjects and authors to include, and how to present the materials, the project was begun, with a budget of $2,000,000. On April 15, 1952, the Great Books of the Western World were presented at a publication party in the Waldorf-Astoria Hotel, in New York City. In his speech, Hutchins said, "This is more than a set of books, and more than a liberal education. Great Books of the Western World is an act of piety. Here are the sources of our being. Here is our heritage. This is the West. This is its meaning for mankind." The first two sets of books were given to Elizabeth II, Queen of the United Kingdom, and to Harry S. Truman, the incumbent U.S. President. The initial sales of the book sets were poor, with only 1,863 sets sold in 1952, and less than one-tenth of that number of book sets were sold in 1953. A financial debacle loomed until Encyclopædia Britannica altered the sales strategy, and sold the book set through experienced door-to-door encyclopædia-salesmen, as Hutchins had feared; but, through that method, 50,000 sets were sold in 1961. 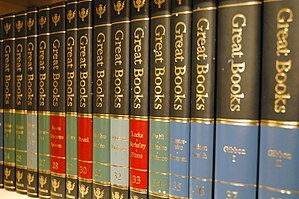 In 1963 the editors published Gateway to the Great Books, a ten-volume set of readings meant to introduce the authors and the subjects of the Great Books. Each year, from 1961 to 1998, the editors published The Great Ideas Today, an annual updating about the applicability of the Great Books to contemporary life. The Internet and the E-book reader have made available some of the Great Books of the Western World in an on-line format. The second edition of Great Books of the Western World, 1990, saw an increase from 54 to 60 volumes, with updated translations. The six new volumes concerned the 20th century, an era of which the first edition's sole representative was Freud. Some of the other volumes were re-arranged, with even more pre-20th century material added but with four texts deleted: Apollonius' On Conic Sections, Laurence Sterne's Tristram Shandy, Henry Fielding's Tom Jones, and Joseph Fourier's Analytical Theory of Heat. Adler later expressed regret about dropping On Conic Sections and Tom Jones. Adler also voiced disagreement with the addition of Voltaire's Candide, and said that the Syntopicon should have included references to the Koran. He addressed criticisms that the set was too heavily Western European and did not adequately represent women and minority authors. The choice of authors has come under attack, with some dismissing the project as a celebration of dead European males, ignoring contributions of women and non-European authors. The criticism swelled in tandem with the feminist and civil rights movements. Similarly, in his Europe: A History, Norman Davies criticizes the compilation for overrepresenting selected parts of the western world, especially Britain and the U.S., while ignoring the other, particularly Central and Eastern Europe. According to his calculation, in 151 authors included in both editions, there are 49 English or American authors, 27 Frenchmen, 20 Germans, 15 ancient Greeks, 9 ancient Romans, 4 Russians, 4 Scandinavians, 3 Spaniards, 3 Italians, 3 Irishmen, 3 Scots, and 3 Eastern Europeans. Prejudices and preferences, he concludes, are self-evident. In response, such criticisms have been derided as ad hominem and biased in themselves. The counter-argument maintains that such criticisms discount the importance of books solely because of generic, imprecise and possibly irrelevant characteristics of the books' authors, rather than because of the content of the books themselves. Others thought that while the selected authors were worthy, too much emphasis was placed on the complete works of a single author rather than a wider selection of authors and representative works (for instance, all of Shakespeare's plays are included). The second edition of the set already contained 130 authors and 517 individual works. The editors point out that the guides to additional reading for each topic in the Syntopicon refer the interested reader to many more authors. Because the great bulk of mankind have never had the chance to get a liberal education, it cannot be "proved" that they can get it. Neither can it be "proved" that they cannot. The statement of the ideal, however, is of value in indicating the direction that education should take. Since the great majority of the works were still in print, one critic noted that the company could have saved two million dollars and simply written a list. Encyclopædia Britannica's aggressive promotion produced solid sales. Dense formatting also did not help readability. The second edition selected translations that were generally considered an improvement, though the cramped typography remained. Through reading plans and the Syntopicon, the editors have attempted to guide readers through the set. Presenting a wide variety and divergence of views or opinions, among which there is likely to be some truth but also much more error, the Syntopicon [and by extension the larger set itself] invites readers to think for themselves and make up their own minds on every topic under consideration. ^ Milton Meyer (1993). "Robert Maynard Hutchins: A Memoir". University of California Press. Retrieved 2007-05-30. This biography of Robert M. Hutchins contains an extensive discussion of the Great Books project. ^ Carrie Golus (2002-07-11). "Special Collections tells the story of a cornerstone of American education". The University of Chicago Chronicle. Retrieved 2007-05-30. ^ "Great Books of the Western World (eBooks @ University of Adelaide)". University of Adelaide. Retrieved 7 June 2012. ^ Venant, Elizabeth (3 December 1990). "A Curmudgeon Stands His Ground". The Los Angeles Times. ^ Sabrina Walters (2001-07-01). "Great Books won Adler fame, scorn". Chicago Sun-Times. Retrieved 2007-07-01. ^ Peter Temes (2001-07-03). "Death of a Great Reader and Philosopher". Chicago Sun-Times. Archived from the original on 2007-11-04. Retrieved 2007-07-11. ^ Mortimer Adler (September 1997). "Selecting works for the 1990 edition of Great Books of the Western World". Great Books Index. Archived from the original on 2007-09-27. Retrieved 2007-05-29. We did not base our selections on an author's nationality, religion, politics, or field of study; nor on an author's race or gender. Great books were not chosen to make up quotas of any kind; there was no "affirmative action" in the process. ^ Mortimer J. Adler (1990). "Bibliography of Additional Readings". The Syntopicon: II. Great Books of the Western World, vol. 1–2 (2nd ed.). Encyclopædia Britannica, Inc. pp. 909–996. ISBN 0-85229-531-6. ^ Robert M. Hutchins (1952). "Chapter VI: Education for All". The Great Conversation. Encyclopædia Britannica, Inc. p. 44. ^ Macdonald, Dwight. "The Book-of-the-Millennium Club". 29 November 1952 with later appendix. The New Yorker. Retrieved 2007-05-29. I also wonder how many of the over 100,000 customers who have by now caved in under the pressure of Mr. Harden and his banner-bearing colleagues are doing much browsing in these upland pastures? ^ Mortimer J. Adler (1990). The Great Conversation (2nd ed.). Encyclopædia Britannica, Inc. pp. 33–34 for discussion of new translations, pp. 74–98 for reading plans and guides. ISBN 0-85229-531-6. ^ Mortimer J. Adler (1990). "Section 1: The Great Books and the Great Ideas". The Great Conversation (2nd ed.). Encyclopædia Britannica, Inc. p. 27. ISBN 0-85229-531-6.